It is 10:30AM and there is great excitement aboard. Everyone is milling about waiting for tenders to go ashore to what must be the tiniest island destination for a cruise ship: Carti Tupili Island, which is one of the San Blas Islands. There are Cuna Indians in canoes circling the ship as we anchor, waiting for all those US$ to flow into their eager hands…or in this case diving for coins being thrown down by the passengers. I stay on the ship this morning since I want to avoid the madness of jostling for the first few tenders. I use this time to catch up on my travel journal and blog, and take some photos of our approach to the islands. I partake of the delicious BBQ lunch served on the Lido pool deck, and then decide it is time to get a tender ticket and go ashore. I only have to wait a couple of minutes before my tender leaves. There are hundreds of Cuna Indian women and children selling stuff. 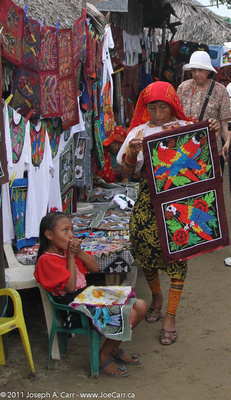 The women are mainly selling Molas, handmade delicately sewn artwork made by arranging brightly coloured fabric into layers and patterns. Others, especially children are offering themselves for photo ops at $1 a shot, with some just looking incredibly cute, while others offer puppies, kittens, rabbits, birds and even a monkey as additional props for the tourists to photograph. Some men are also selling wares: mainly carvings from coconut wood or husks, or artwork. I find this all rather sad to see, and since the whole scene mainly turns me off, I catch a tender back to the ship after about 15 minutes of walking around. Of the 378 islands and cays in the archipelago, 49 are inhabited. As you can see by my photos, the inhabited islands are densely populated – every bit of each island’s land mass is used. There is no electricity from the grid available on these islands; only power from generators is used for a few hours each day as households determine their needs and what they can afford in fuel costs. Transportation to the islands is poor to non-existent unless you own your own seaworthy boat. There is no fresh water available on these islands. Water must be brought in by boat. These islands consist of sand, and are essentially at sea level – there is no elevation to speak of. This entry was posted in Panama and tagged island, textiles. Bookmark the permalink.